The frames are nice looking, and good quality, Thanks! My wonderful daughter-in-law went to Senegal on business and brought me back a small sand painting of an elephant. I fell in love with it immediately and pictured it in a floater frame. My sister is an artist and I have a canvas of hers in such a frame. I called my sister and she recommended picture frames.com. 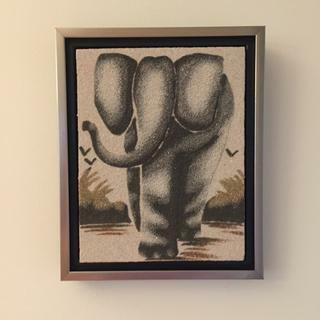 I had envisioned a black frame, but, inspired by your selection, I chose a black frame with pewter-tone face to pick up the gray of the elephant. The piece is on 1/4" board so I glued 1/2" square dowels on the back at the edges so it sits like a 3/4" canvas would -- giving the "pop" I was looking for. Could not be happier -- especially as this is the first time I've framed anything other than a photograph. I have an unframed canvas that I will be framing like this immediately!!! Daughter-in-law was so happy when she saw it -- she imagined I was going to put it in a frame with glass, which would totally lose the wonderful texture. I'm attaching a photo so you can enjoy it too. 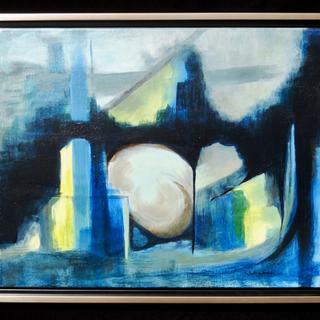 Sets off contemporary and abstract art beautifully. Just the right finishing touch without being heavy or overwhelming. the frames came very well packed and it is very easy to install my canvass into the frame. The product is quite a value and I will definitely order from this website again! The simple lines and color are great for abstract works. The ordering, shipping and the mounting of the artwork was without a problem. thanks! Beautiful frames for our abstract paintings. We love these frames! Perfect frame for my rusted/painting. I love floater frames makes a great presentation! I love this frame. It works with my traditional painting style. I have had positive feedback from customers. I will be ordering more. I ordered two sets of these frames for a pair of 18 x18 inch acrylic paintings that were going into an exhibit. The frames came carefully packaged and fit the canvases just right. They compliment the paintings beautifully. The pewter color is lovely. 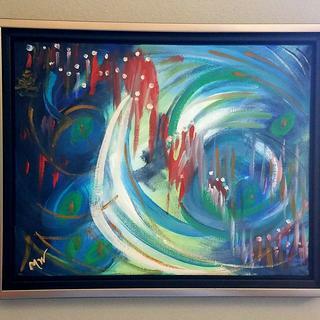 This frame could go with objective or abstract art, contemporary or traditional. I chose this floater frame for a gallery wrapped canvas that is painted on the sides and it just looks wonderful. Better than I even imagined. It complements the colors of the paining and allows a glimpse of the edges. I would definitely recommend this frame! This frame looks perfect on my perfect pup! Great deal on float frames! I was very happy with the quality, efficient shipping, and value. I uses these for my art and them take my paintings to the museum level. Thanks! Perfect beautiful we love it! Amazing fit amazing price! Had a good phone conversation and placed my order after a few questions. Frame is good quality and arrived without damage. The silver is just the right amount to perk up the artwork and not be surrounded solely by black. A nice touch of class. Wonderful frame! Would be great if you come with a frame for panel. Frames were exactly what we needed and was perfect for my office. The “look” of the floating frame with the black slight margin helped set my canvas off that much more. Perfect look! Beautiful frame. Perfect customer service. I highly recommend this vendor. Write your review here. It must be at least 50 characters long. ConsidJust what I was looking for at a great priceer whether you would recommend this product and what you like or dislike about it. Looks perfect! Just the right look and style to compliment my painting. Beautiful frame! The frame is sturdy and well made and very attractive! Ive used it several times ! It really gives a contemporary finish to the art. The frames are very good. They certainly enhance the pictures very much. One drawback -- the screws supplied are fewer than the frame requires. Hello Deborah! 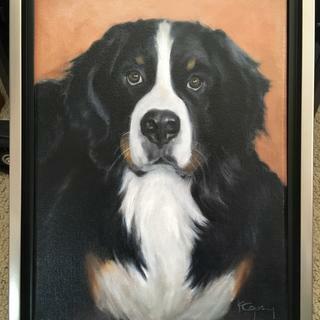 We are pleased to hear that the frame enhances your artwork so well! Thank you for responding to my voicemail requesting photos of the damaged frame be emailed to Customer Care. The photos will help us work with our carrier to improve quality control. I have since then reviewed the photos. We sincerely apologize for the small crack in the frame. The replacement order has been created and the order details have been emailed to you. The replacement will arrive by next week. Please email me if you need anything else. Thank you again for allowing us to make this right with you! Happy Framing! Frame arrived damaged--two chips on upper part of frame. Not practical to return given difficulty of repacking. Hello Dennis. Thank you for letting us know about the issues with the order. We apologize that the frame arrived with two chips and we would like to send you a free replacement. If you could please take photos of the frame and email those to customercare@pictureframes.com- Attention Shea. The photos will help us with our quality control. You will NOT need to return the damaged frame once we see the photos. We look forward to hearing from you. Thank you for your business. This frame's quality was better than I was expecting for the price. It was well made and the aesthetic quality was great. The hardware which was included was the only disappointment. The mounting brackets seemed too short, placing the screw holes on top of a narrow area of the frame profile which caused the screws to come out of the front of the frame, only by a tiny bit. I covered up these spots with black acrylic paint and it was no longer noticeable. The kit was also short two screws, but I had extras on hand. The hardware kit was not perfect, but the quality of the frame itself was very good for the price and I would purchase this frame again. Hello John. Thank you for your feedback regarding the hardware that was included with the frame. We are examining our hardware to see how this incident could have occurred. In the future, please give us a call if you have any missing hardware, or concerns with the order. We are happy to resolve any concerns you have with the order. If you have any further questions, please give us a call. It had a rich look. I'm planning on using it with a tapestry piece that I set up with canvas stretchers. 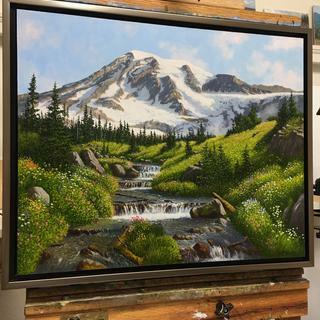 National chain hobby shop quoted me $700 to frame in a less attractive frame. I like the black on the thickness of the frame and the black shadow area once the painting is in place. I think the pewter will go well with the clouds in the painting I am going to use this for. I've ordered a similar frame and loved the style. This black/pewter frame will highlight my canvas very nicely. I have 10x10 art boards and will create plein air paintings at a festival to sell. Quality of frame I can rely on. I asked for a sample of this frame to see how it would look with my artwork. I was very happy with the quality of the wood and the finish. Order samples if you are not sure. It is extremely helpful and only took a few days to receive. It gives the painting a clean, contemporary finish. Classic frame that doesn't distract from the painting and with a small boarder of metallic to accent the painting. This is my second order and it will not be the last. Frames arrived in excellent condition. Very well packed and this shows the great care they take to ship this product. My only wish is that it didn't take so long to get the products. Maybe a west coast warehouse is in order. Thanks for the great service and product. The metallic sheen is matted which elevates without being garish. I wanted a minimal frame that would enhance the appearance of my canvas. Because, my Black & White ABSTRACT painting would be perfectly go with this frame. I recently bought same style in different color and it was great. Very happy with the quality and fitting. Floating frames allow for a more professional look to my work. They accent all parts of the painting from edge to edge. The simplicity of the frame sets off the painting and does not distract from it. 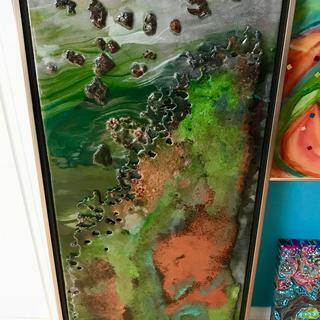 I love the floater look for most of my paintings which tend to be contemporary in nature. 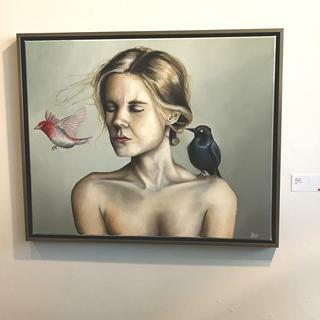 This kind of frame should fit my paintings in style and color. Hard to explain without seeing the paintings. can the float frame be used for print on hardboard? 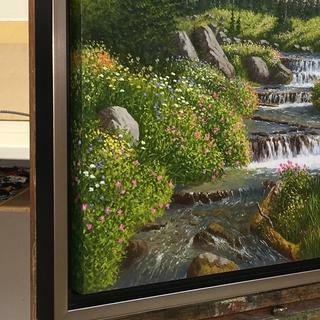 BEST ANSWER: I personally love the way this frame looks, but I think that the best way to use this frame is when the painting is leveled with the frame, or close to the same level when looking from the side. In other words the depth of the canvas or board should be the same as the depth of the frame, so the painting or print is not sticking out and not sitting deep inside the frame.I use it for 0.75" canvases and it fits perfectly. It has to be leveled. If you can achieve that with your wooden board, then all good. If the board is too thin use something to fill the gap. I found that wine bottle corks sliced horizontally to required size, make a great filler. Thank you for your inquiry. You could use the floater frame for a print on hardboard, but note that the side of the print can be seen in the floater space. So if you leave the borders untreated it may take away from the final presentation. Also, it's important to keep in mind that this frame has a rabbet of 3/4", so you would want your hardboard to be close to that depth. If you have additional questions do not hesitate to contact our friendly framing experts at 1-800-332-8884 Monday - Friday. This frame is designed for stretched canvas, which is attached with screws into the stretcher bars. To use this frame with hardboard, you may need to use shorter screws that will not go all the way through the hardboard, or use some kind of adhesive to mount the print in this frame. Can these be used for an ampersand gesso board panel? BEST ANSWER: Thank you for your inquiry! We suggest ordering a sample of the frame to ensure the item will work with your panel. With a floater frame, should the canvas be the same depth as the frame when mounted? BEST ANSWER: Hello. We suggest the depth of the canvas be very close to the depth of the frame. That will ensure a more flush appearance. Thanks! I have a 1" canvas. It is 24" x 36". Will this fit? BEST ANSWER: Hello Linda! We can easily cut the frame to size 24"x36". 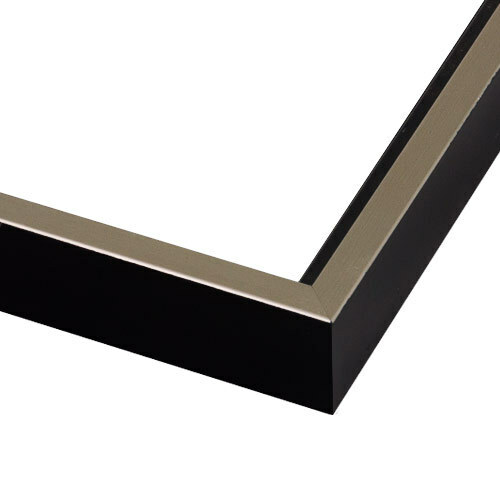 The depth of this beautiful frame is 11/16" which will cause your canvas to protrude from the front of the frame by 1/4". You may not be able to notice the canvas is deeper than the frame when viewing the artwork hanging on the wall. If you have any additional questions, please let us know. Happy Framing. My canvas measures 15/16" thick. Which depth of the CSF7 frame would work best? BEST ANSWER: Hello! Thank you so much for reaching out to us. We have this beautiful Black and Silver Canvas Floater in two depths which are 11/16" and 1 5/8".The CSF7 is 11/16" in depth which is very close to the 15/16" depth of your canvas. The CSF7 will work best with your canvas. If you need further assistance, please give us a call. Have a great day! Happy Framing! My canvas is 36 and 1/8 -- not 36 -- how do I enter that size when ordering?? BEST ANSWER: Hello Warren! Thank you for reaching out to us. You will notice two boxes for the width and height. Please enter 36" in the first box and 1/8" in the second box. Please take note of the depth of your canvas. The depth of the frame is 11/16" which is compatible for a canvas that is 11/16" or less. If you have any questions, please let us know. Happy Framing! It fit with a 3/8" depth canvas? BEST ANSWER: Hello! The depth of the frame is 11/16" which is deeper than the canvas. The canvas will fit however the canvas will not be flush with the face of the frame. The canvas will in fact recess into the frame by 1/4" which may not be very visible to the eye. If you have any additional questions, please let us know. Happy Framing!